Are you someone who tends to be more active when the weather gets warmer? Well, you’re not alone, especially after the winter that we’ve had here in the Mid-Atlantic. And between the summer time sports mishaps and the sandals snafus, this heavily anticipated change in weather is the time when we tend to see large increases in orthopedic injuries. The majority of individuals attempt to go from being completely sedentary over the winter months to no holds barred, full throttle spring and summer activities. This trend has all the makings of accident or injury. Ankle sprain and knee tendonitis or cartilage/meniscus injury due multiple reasons, from twisting the foot or leg, falling, sports injuries and even wearing unstable footwear such as flip-flops or clogs. Plantar fasciitis and stress fractures of the foot from high-impact activities like jumping, track, basketball, etc; all while wearing improper and/or unsupportive footwear. Golfer’s and tennis elbow, which are repetitive-stressor based activities. Shoulder tendinopathy due to overuse while completing household activities such as gardening, mulching, painting, digging, hammering, etc. Wrist, arm and shoulder fractures from various falls. Immediately stop the provoking activity, and do not attempt to play or work through the pain. If 36-48 hours pass and the pain has not improved, schedule a visit to see a physician. There are several specific warning signs that are good indicators that you may need immediate care – obvious deformity, joint instability, decreased range of motion and persistent joint swelling. With all of this in mind, hop off of the couch and start enjoying this nice weather. It is long overdue! Make time to workout this Holiday Season…despite your injury! That’s right! You CAN maintain fitness while injured. There are ways to continue with your exercise regime – properly, safely & effectively. Learn how! • Learn how to overcome mental challenges that can occur with an injury. • Learn how to avoid getting injured. • Get health tips on how eating right can help you heal…& more! Get expert advice from Assistant Director of Sports Performance & Athletic Trainer Carrie Dudley, M.S., AT. You don’t have to have an injury to attend – Everyone can benefit from this insightful lecture. Q&A to follow. All are welcome! Empower Your Mind –&- Get Back to Health. ‘See you next Thursday! Are you struggling through your day with low energy? Are you too stressed to make healthy balanced meals for you & your family? Are you feeling frustrated you aren’t reaching your health & wellness goals? Have diets failed you? If you answered “Yes” to any of these questions, you need Nutritional Intervention! Imagine feeling renewed & energized everyday! This is possible – PSSM can help! Discover Nutritional Wellness with PSSM. Performance Spine & Sports Medicine is a proud partner of Gold’s Gym “Extra, Extra” Wellness Series ~ designed just for you! • Decoding popular diets…. Calorie counting (when, why, how) & more! Get expert advice from Chiropractic Physicians Susann Clothier, D.C. & Michael Dougherty. Everyone can benefit from this important health topic. Bring a friend! Empower Your Mind –&- Get Back to Health. ‘See you Thursday! Make August AWESOME with PSSM! We’re holding our first Staff FITNESS CHALLENGE for the month of August! We are encouraging staff to take their workout to the next level with exercises that will challenge the mind & body. Check out our calendar above! Do you think YOU think you have what it takes? Tell us! – Log onto our Facebook page: Facebook.com/PSSMLawrenceville. Team PSSM Needs YOU: We believe in teamwork – Help your ‘favorite’ PSSM contestant earn PSSM ‘star points’ for the big Win! You can help by simply “liking” any post they make onto our Facebook page about this Challenge. Contestants earn ‘stars’ for every online engagement they make AND every daily exercise they complete! Be a *STAR* & “root, root, root” for Team PSSM. Join the FUN!! We appreciate you! We’s like to extend this contest to our Patients & Friends for our next challenge….with a grand prize! Will you commit to get fit? Everyone can benefit from daily exercise for a healthy body & mind. Stay tuned for our contest. Be sure to visit our Facebook page for updates & motivation to keep you inspired. Enjoy the rest of your Summer in good health. “Extra, Extra!” — Got Sciatica? ‘Got Sciatica? Sciatica is among the most common causes of low back pain that affects millions of Americans each year. Without the proper treatment, it can quickly worsen. Our team of Chiropractic Physicians & Physical Therapists will help! • What does “Sciatica” really mean? • Who is at risk for developing Sciatica? • What are common causes, signs & symptoms of sciatic pain? • How can chiropractic & physical therapy help in the treatment of Sciatica? Learn MORE: Get expert advice from Susann Clothier, D.C. (Chiropractic Physician) & Our experts will answer your questions about Sciatica & speak about non-surgical treatment options immediately available. Everyone can benefit from this important health topic. Empower your mind & learn how to eliminate your pain. ‘See you next Thursday! Do you suffer from Neck or Shoulder pain? Look no further! Your solution to the best non-surgical approach in diagnosis & management is here! Empower Yourself. Eliminate Your Pain! Learn more! MARK YOUR CALENDAR! Gold’s Gym of Lawrenceville, NJ, is proud to host some of Performance Spine & Sports Medicine’s healthcare seminars, designed for you! Make PSSM at Gold’s Gym your FREE access to expert advice. You deserve the best in health ~ ‘See you there! NFL Draft 2013 News and Orthopedic Doctors Reveal the FAST (Fasciotomy and Surgical Tenotomy) for Athletes!! 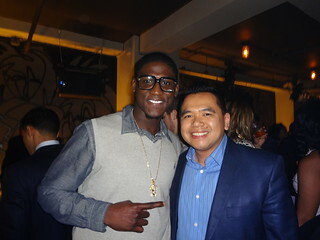 NFL Pre- Draft Party at EVR Lounge in NYC with Performance Spine & Sports Medicine Doctors sponsor a party for NFL Draft Candidate, Xavier Rhodes (click his name and hyperlink for his NFL profile). Xavier Rhodes from Florida State, is a Corner Back and His Combine numbers are amazing…He runs a 40 yard dash in 4.43 seconds and can jump 40.5 inches vertically. As with any sport, Athletes can be injured any time from nagging tendon, ligament or joint injuries. Performance Spine & Sports Medicine (PSSM) introduce the FAST procedure which stands for (Fasciotomy and Surgical Tenotomy) which is a minimally invasive procedure to repair ligaments and tendons of any joint. The doctors at PSSM are one of the first physicians in New Jersey and Pennsylvania to offer this cutting edge Procedure which takes minutes. We first use ultrasound to visualize the injury. We then use a sophisticated probe to suction out the scar tissue (which is the black and dark gray areas in the ultrasound image and cause very TINY MICRO-TEARS in the tissues to STIMULATE REGROWTH and REGENERATION of tendon, muscles and ligaments!! This procedure can treat Shoulder Injuries like Rotator Cuff Tears, Knee injuries like patellar tendon injuries, and TENNIS or GOLFER’S ELBOW! The procedure is done in minutes and patient requires minimal to NO stitching. It is a same day procedure and the athlete or patient can start rehabilitation the next day (of course at the discretion of the doctor). At our clinic, we are seeing over 90% success rates in terms of pain improvement and athletes can be completely healed within 2 – 4 weeks depending on the injury! Below is a video of the procedure. We are publishing our first scientific abstract showing the effectiveness of the procedure which is coming soon! !